Real Red. Bashful Blue. Snowmen. Peppermints. Perfect Combination! I CASED this idea from Pinterest, but did a few tweaks to fit my supply stash. 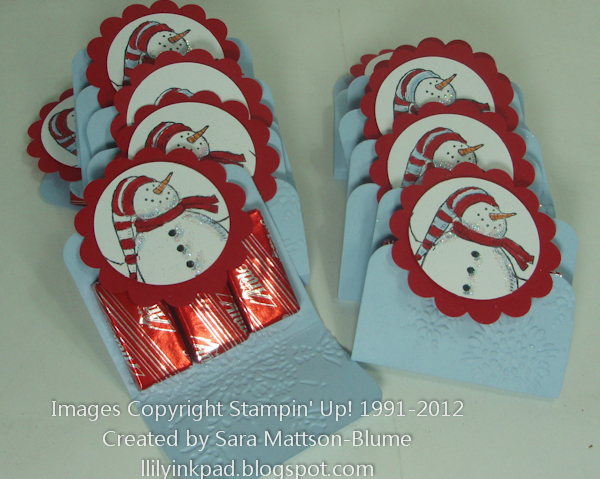 I loved the idea of a quick and easy (and yummy) favor for my stampers this month. I also found I love these Andes Peppermints. That may not be a good thing. I love it, though, when the candy companies use Stampin' Up! colors so we can use them in our projects as is! I first stamped the images, punched and colored them. I added Two Way glue where I wanted sparkle and sprinkled Dazzling Diamonds on top. I scored the tags 1/4" from the score line towards the bottom of the tag. I think 3/8" would be a bit better. The tag closes because I used dimensionals to adhere the scallops onto the top of the tag. I just then folded the tag under. When my stampers saw them, they were hoping it was a project for the night, so I think they were a hit! Plus, I had my niece give them each one and say "Merry Christmas." Casting these for sure! Thanks for sharing the project and your construction notes, too! Super cute and yummy too! I love the touch of sparkle from the Dazzling Diamonds! How adorable! I love when an easy project is an instant hit! Snow Much Fun to Be Colorful!